Whether you’re selling on Etsy, Amazon or other marketplace, Voco helps you build a perfect channel for your products. VOCO is our best theme yet to showcase products sold in various marketplaces, from Etsy to Amazon. 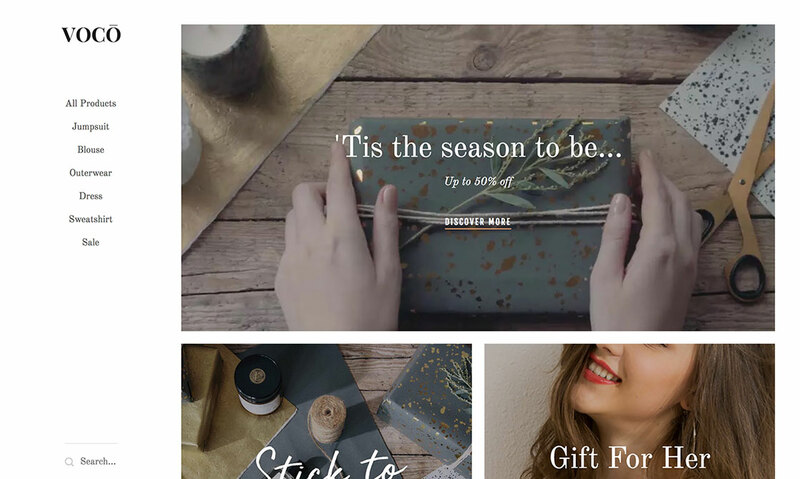 Featuring subtle minimal design, banner spaces for campaigns, unlimited product pictures, pricing, and easy to set up contact page, making it as a perfect product-showcasing site — a new channel for people to discover your products. The homepage covers up to three banners by default and two variants with optional captions for you to deliver a powerful campaigns. Add, edit or remove them as your creative needs require. Voco is entirely responsive, means your content will scale to fit any screen size, from desktops to mobile phones. Voco has Buy Button built-in, allowing you to showcase your products sold on Etsy, Amazon, or direct transaction with PayPal. Voco is based on the v3 framework with show/hide widget capability and new comment form UI. Backgrounds and scripts used to create Voco are included in a separate folder. Making backup easier.